This species is accepted, and its native range is Gabon to Kenya and Angola. 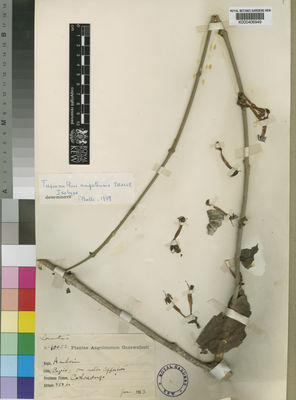 Plant glabrous; twigs slightly compressed at first. Leaves mostly opposite; petiole 5–15(–20) mm. long; lamina ± coriaceous, green to slightly glaucous, lanceolate to ovate, 4.5–15 cm. long, 1.2–8 cm. wide, acuminate at the apex, rounded to cordate, rarely broadly cuneate, at the base, with 8–12 pairs of lateral nerves, lower 2–3 strongly ascending. Umbels (2–)4-flowered; peduncle 2–4 mm. long; pedicels 0.5–3 mm. long from well-developed sockets; bract saucer-shaped, with a small triangular limb, 1–2 mm. long. Receptacle obconic, 1–2 mm. long. Calyx shortly cupular, 1–2 mm. long, ciliolate. Corolla-tube 3.2–4 cm. long, pink to crimson, sometimes darker along filament-lines, head of buds green turning blue-grey to purple; bud-heads oblong-ellipsoid, obtuse to truncate, angled to ribbed or narrowly winged, sometimes with bosses or triangular points up to 1 mm. long overtopping the apex, 3.5–4 mm. long, 2–2.5 mm. in diameter; basal swelling 3.5–6 mm. long, 2.5–4 mm. in diameter, with the tube constricted for 3–8 mm. above; lobes reflexed, 6–7 mm. long, slightly corrugated on claw, expanded tip narrowly elliptic, 3.5–4 mm. long, 1–1.5 mm. wide (excluding margins). Stamens with tooth 0.5–0.7 mm. long; anthers 2–2.5 mm. long. Style with a neck 2–2.5 mm. long; stigma capitate, 0.7–0.8 mm. across. Berry urceolate, 10 mm. long, 6 mm. in diameter. Evergreen forest, on various hosts including plantation crops; 1100–2300 m.
Polh. & Wiens in Mistletoes Afr. : 189, photo. 76 (1998). Troupin, Fl. Pl. Lign. Rwanda: 378 (1982). Balle & Troupin in Troupin, Fl. Rwanda 1: 189 (1978).